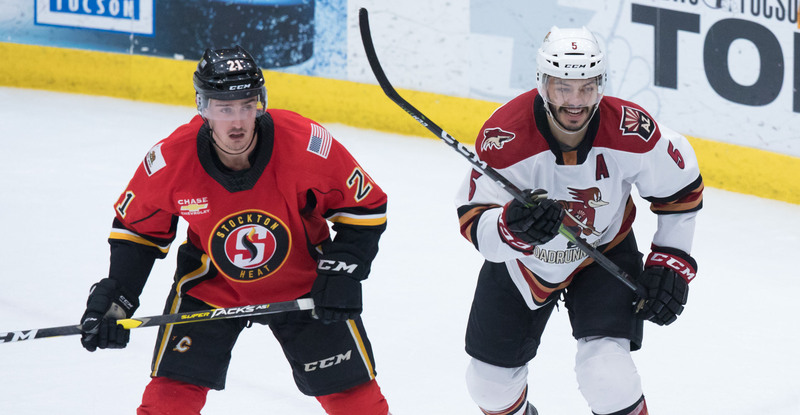 After falling behind 2-1 early in the second period Friday night, the Roadrunners responded with four unanswered goals to defeat the Stockton Heat by a 5-2 count. 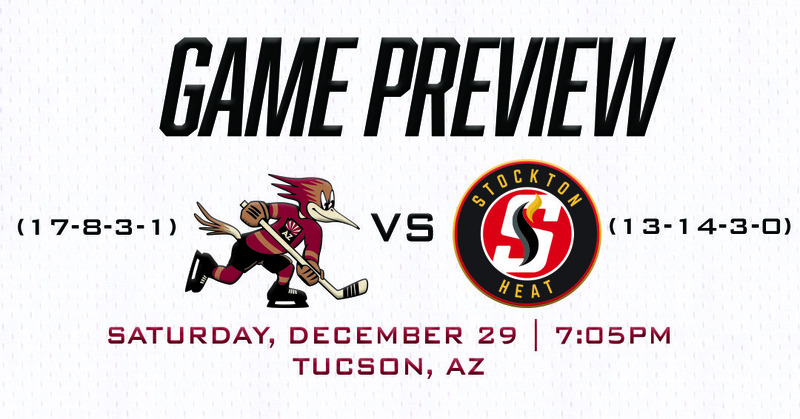 Tonight marks the fifth of eight regular season meetings to be played between the two clubs, and the final of such at Tucson Arena. The Roadrunners improved their mark on home ice to 10-3-0-0 on the year, a .769 win percentage as hosts which ranks as the third-best in the American Hockey League, trailing only the San Jose Barracuda at SAP Center (.808%) and the Bridgeport Sound Tigers at Webster Bank Arena (.844%). Now with points in three consecutive games (2-0-1-0), the Roadrunners sit just two standings points behind the Pacific Division’s first-place San Jose Barracuda. The Barracuda do not play tonight. Forward Giovanni Fiore made his team debut last night following the trade that sent defenseman Trevor Murphy to the Anaheim Ducks’ organization. Fiore finished the night credited with three shots on goal and an even +/- rating. Murphy has reported to the San Diego Gulls. The Roadrunners are 6-5-1-0 this season on zero days rest, with a 3-2-0-0 mark when playing the second half of a back-to-back set on home ice. Tucson has pocketed points in nine of 11 games played during the month of December (6-3-2-0). It is unclear if Michael Bunting, who was re-assigned to the Roadrunners from the Arizona Coyotes on Saturday afternoon, will play tonight. He has not appeared in a game with the Roadrunners since December 5, and has 18 points (6G, 12A) in 20 AHL games this season. The fourth-year forward scored one goal in four NHL games during his recalls. MATCHING: In opening the scoring Friday night, Jens Looke buried his sixth goal of the season, matching his total attained during his rookie season in 2017-18, which he accumulated in 59 games played. Friday was just Looke’s 22nd game of the year and his first since December 12 after missing the team’s previous five due to an injury. With nine points (6G, 3A) on the year, the 21-year-old is on pace to surpass his total of 17 (6G, 11A) set last season. MULTIPLE MERKLEY: Nick Merkley registered his first multi-point performance of the season Friday night, finishing the evening with a goal and an assist. He is nearly producing at a point-per-game pace since returning to the lineup with a total of five (2G, 3A) in six contests played. A LOT OF POWER: The Roadrunners, with Robbie Russo’s tally during a 5-on-3 man advantage, improved to 11-3-2-0 this season when scoring at least one power play goal. With points earned in 13 of 16 games played when executing offensively on special teams, the club’s ability to find the back of the net in such situations hold a ton of influence. Tucson’s power play currently ranks 23rd in the AHL with a 15.9% success rate (22-for-138). ONE-HUNDRED: The Roadrunners’ fifth and final goal scored Friday night, that coming off the stick of defenseman Robbie Russo, served as the 100th scored by the team this season. They enter the night 10th in the AHL in goals-for-per-game, averaging 3.45.